An interesting thing happens when the nest empties out. The grocery bill drops, the wine bill rises, the utilities drop, tuition rises, and your friends slowly change. Throughout the years, all of our friendships revolved around school and sports. I have spent many cold evenings on the baseball field and long days in the gym with some wonderful friends. Late night parties in hotels all over the country, memories I wouldn't give back for anything. But when the kids fly the coop, you start to lose touch. Not on purpose, but it happened with many of those people I love. Sometimes I feel sorry about that, but things change. It's no different than making new friends in high school or new friends in college. Preschool friends and high school friends are likely different. Recently, this empty nester made a new friend. It turns out she is friends with one of my volleyball parents that I loved like a sister and haven't seen in a long time. And, friends with a neighbor that I see at Bunco every month, but not too much beyond that. Although I knew upon meeting her that we would be well matched friends. She has a really great bar and knows how to use it. That is a plus, really, I work at a kitchen store, I love this stuff. So my new friend and I have covered every topic from girls drama (our girls are not dramatic, thank the lord), sewing and crafting, the Bachelor (yea, don't judge), and criminals. The criminal may appear in another blog. I also made her some cookies for her daughter in college, a KD. I love making cookies like these. I can hear the giggles and girl talk, the late night pizza deliveries and the study sessions. I remember those friendships, and I remember moving on in the next phase of life. This is the beauty of Social Networking. I have reconnected with many of those old friends, and I love that my kids too are making friends for a lifetime. So here's to empty nests, sorority girls, college and lifelong friendships. And the Bachelor. I have new friends to watch it with! And no one is happier about that than me, except maybe Mr. Preppy! So, what are you waiting for? Get in there and bake! Life of Pi- This movie is gorgeous, a beautifully shot movie with some hilarious one liners in the beginning. I wish I could remember them, all about religion and this Indian boy's quest to understand while being an Hindu/Catholic/Jew. I think that's the combo. The boat scene is too long for me. 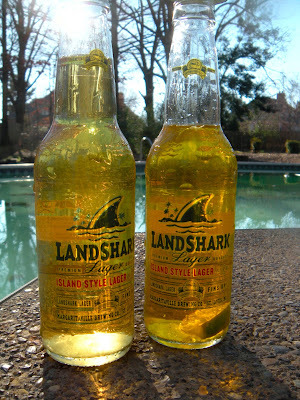 I mean way to long, and the seas are stormy, so I decided I would like this movie best with a Dark and Stormy. I have blogged this delicious creation before here, but here's the recipe and a peek. Perfect with Pi. A shot of vodka, a shot of Goslings Black Rum and ginger beer. The photo is above. No, you cannot sub another rum or ginger ale. Trust me. Amour-I wish I had Absinthe. I mean this movie is all about death. It is awful. Sorry. I get the idea, the heart wrenching decisions, the one true love. But it is not entertaining, and I like to be entertained. 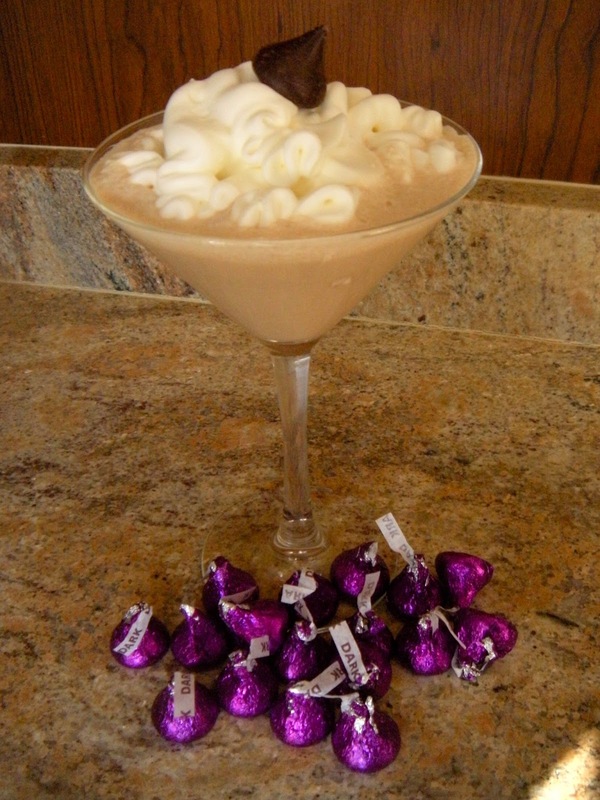 So, how about a chocolate martini called a French Kiss. If you follow me on Pinterest, which you should, you will see I pinned this martini to my Liquid Courage board. Sadly, it is a dead link. So, I looked at the picture and punted. Here's how it went. I made the Tootsie Roll found below. I added another 1/3 ounce (or so) of Godiva, and a little half and half to make it creamy. I topped it with fresh whipped cream and a kiss. Which by the way, are kind of heavy and you have have to take a quick picture before they sink! It's really rich and gave me a bit of a stomach ache. Not my kind of cocktail. Beasts of the Southern Wild- I started to watch this movie and quit. Then I decided to watch it again. I'm glad I did as I enjoyed it. I also enjoy Duck Dynasty and Swamp People, so I guess I have a soft spot for the Cajun wilds of Louisiana. There was just one drink for this; Swamp Water. That's the link to the original recipe, but I can't go there. I am allergic to fruit flavored (most of them anyway) liquors. So I decided it was all about the vessel and the color. 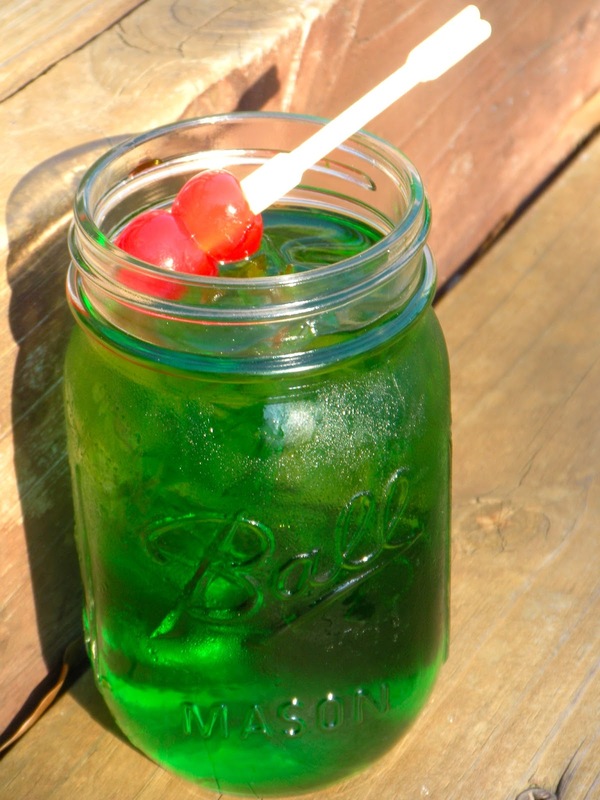 So I made a Jack and Ginger with a drop or 2 of food coloring for zing! Swamp Water for a Yankee is what I'll call this delicious creation. It is one of my standby drinks, but not usually green! I had a handyman bring me some Moonshine once, and it reminded me of the home made liquor in Bosnia. Not fit for consumption! Ugh! A little food coloring goes a long way! Django Unchained- One of the 2 nominees I haven't seen yet. My brother in law filmed part of this movie, so I will see it. 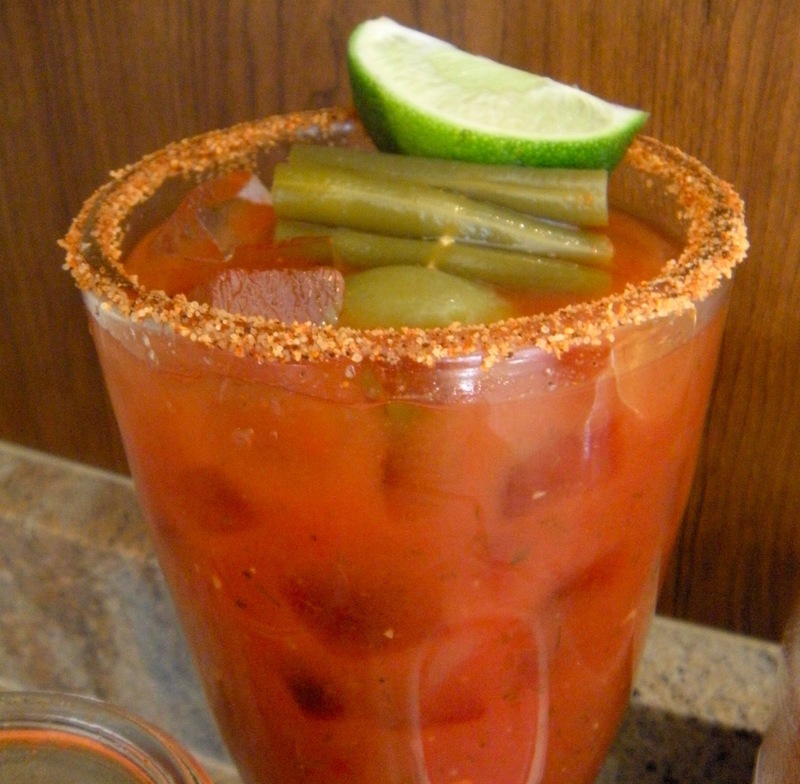 He did his part in New Orleans, and the movie is supposed to be pretty violent, so I thought maybe a Cajun Bloody Mary. Start with the rim of your glass, and swipe it with lime. Dip the rim in Tony Chachere's seasoning. (Heck, sprinkle Tony's on everything you cook!) Then add the ice, vodka, and mixer. 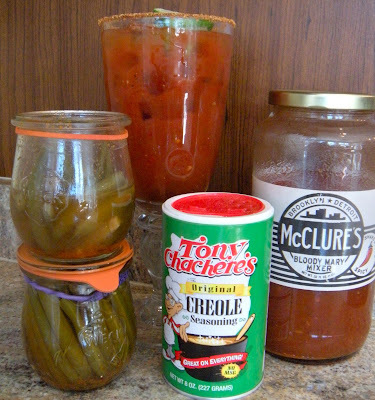 I am in love with McClure's Bloody Mary Mix. I am the only one in my family that likes it, it is very pickle juice based, so not for everyone. It is also very spicy. I adorned my glass with lime, an olive and my very own Dilly Beans. I can a batch or 2 every summer. The rubber band around the jar is my reminder that those are special jars with additional hot pepper in the jar beside the cayenne. If your mix isn't spicy then only Tabasco or Crystal Hot Sauce will do. You must keep it authentic! Don't forget Tony's on the rim! Les Mis- My least favorite Broadway play of all time. Go ahead, moan. I remember when I saw it, there was SO much fuss. It was a huge deal to get tickets. I really did not enjoy it. Yes, the music is beautiful. This is the only other nominee I didn't watch. I will, one day, when I have lots of time on my hand. So I really had trouble deciding a cocktail since I missed the movie. So I phoned it in. Have a glass of Chardonnay. Much to the dismay of many friends, I don't really care for that either! Lincoln-This movie was great. I did feel like I learned a lot about the battles both in the government and on the fields of our nation. As a Midwesterner living in the South, you really only hear one version of the story down here. There were no members of my family living in either the Union or the Confederacy at this time, so I am very neutral. Oh, I'm sorry, did you think this war was over? For Lincoln, we needed a shooter, get it? So I decided a Tootsie Roll, since they look like logs for Lincoln's log cabin. See how this all works? The recipe calls for chocolate vodka, but I only had vanilla vodka, so I added Godiva. My recipe was 1/3 ounce of each, vanilla vodka, amaretto and Godiva, and then Hershey's chocolate syrup for good measure. Didn't pull out a single filling! Delicious! Best if you give it a chill. It is tastier on ice. Silver Linings Playbook- This is a great movie. I was a little unsure about the first 20 minutes. But I love a happy ending, I love dancing and I loved the cast in this film. It was remarkable, entertaining and I saw it again just for good measure. And it was just as good the second time around. But what to drink? Philadelphia doesn't have an official drink Well they tried to invent one, but it's called the Philadelphia Flyer. I think that's a hockey team so it wouldn't do in a movie about the Eagles. And let me say Invincible, a movie in Philly, also about the Eagles is my all-time favorite. It's all about the music to me, and that is the soundtrack of my youth. I digress. In the movie they watch football and eat "homemades". I love this language, isn't that what we do? The mom cooks things she knows her family loves, but only her version, and it brings everyone together. So for "homemades" let's have a margarita. I make them myself, they're sort of Eagle Green, and I can't post a can of beer, which I suspect is the drink of choice in Philly on game day! My margarita is a glass rubbed with lime and dipped in kosher salt. Fill it with ice. Add a jigger of tequila, a jigger of Cointreau, a jigger of fresh squeezed lime and a little simple syrup. I don't like it too sweet, so sometimes I add a little water to fill it up. I use this cool citrus tool and just figure a lime per glass. I also eyeball my jiggers, so who really knows. But my family will tell you they rock. This is great tequila, and the bottle is beautiful and easy to repurpose. Zero Dark Thirty- Yikes! This movie will get your heart racing! It is a little controversial with the torture scenes. I think the acting is awesome. I am delighted my son is no longer in the Air Force and I don't think I want to move to the Middle East any time soon. These countries under Islamic law are usually dry. That would be a problem for me. I have no doubt that those men and women serving in the desert would choose an ice cold beer for their first alcoholic beverage. I know I would. And I have a new favorite beer. Land Shark Which is perfect because the movie features Seals....get it?! I know it looks like a Corona, but it tastes so much better. It's so refreshing. A squeeze of lime is perfect. Cut 2 limes; stuff one in the bottle and use the other to wipe on the top of the bottle before every swig. Can't wait for swimming season! Argo- Finally, my winner for Best Picture. I saw it 8 times. Then I bought it on DVD. This is an awesome movie. It is historical, the music is great, it has an amazing cast, great one liners and a happy ending. I was in high school when this all transpired, and it made me miss the early 80's. Again, we are in a country with no alcohol...but alas, they are holed up in the Canadian Ambassador's home. My first choice was this Canadian Cocktail in the video which is Campari, rye and vermouth. I love Campari, and usually have it on hand, but I am out. So I thought I would see if I could find a small bottle at the liquor store. However, my wallet was stolen, I have no credit cards yet, no debit cards, and I am in a cash world this weekend. I couldn't bring myself to spend $35 on a bottle for a blogpost. So I decided to make a Canadian Hillbilly. It's pretty much straight liquor. A shot of Canadian Club, a shot of Tennessee whiskey and ice. If I were trapped in Iran in 1980, I'd drink straight liquor too. 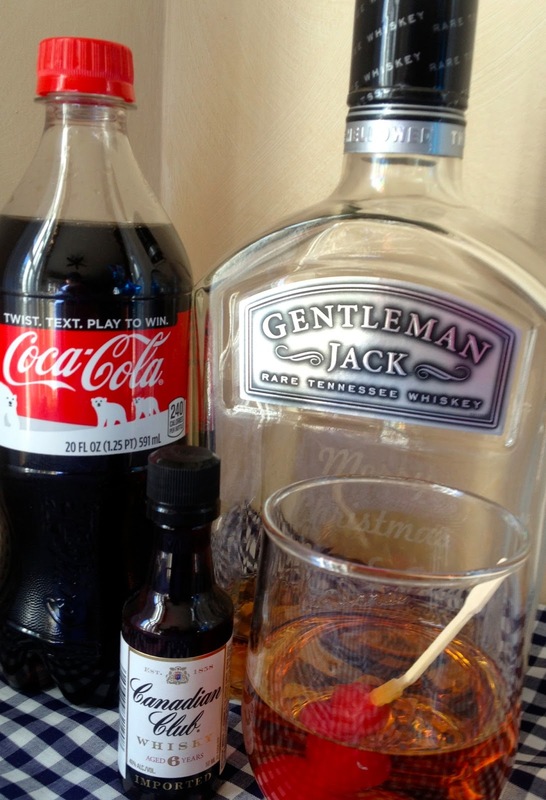 The Canadian Cowgirl calls for the same but with a little Coke. I can't lie, that's how I downed all this dark liquor. It's a good thing this blog wasn't completed in a day because I am a little bleary eyed for sure! And I love cherries in my dark liquor. They're not called for, but I did it anyway! Dark liquor and Coke...perfect for a hostage situation. 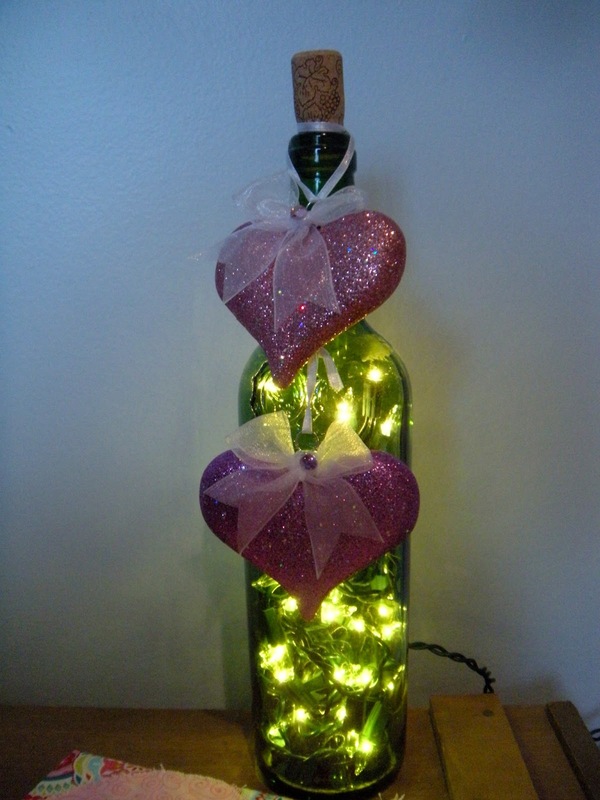 I made these for Valentine's Bunco! It's the 70's and I am one of 16 kids in my small class in Iowa. A day or two before Valentine's Day we all bring a shoebox to school and spend an hour in Art Class (everyone had it back then) gluing construction paper and doilies to the box. Sister would cut the hole in the top with the scissors that had a point. And then on Valentine's Day, we would perch the box on our desk. The little paper Valentines we had bought were signed and the little white envelopes that never stayed closed were addressed with each kids name. And one for Sister. We didn't bring candy, there were no Valentines with superheroes or cartoon characters. They were sweet girls and boys holding hearts and saying Happy Valentine's Day. Our class party would involve no parents, no chicken nuggets, no favor bags and no games. We would have a napkin with a cookie or a cupcake and a paper cup of Kool Aid. And we would sit at our desks and open our valentines and laugh and carry on like kids do. Sometimes we would do a craft, like making a Valentine for our Mom. It was a great childhood. Today I saw a commercial for a party store for all your classroom Valentie party needs. Cupcake towers, pre-made boxes, bouquets of balloons, color coordinated M&Ms and streamers. Really? This year I had a few Valentine projects. The first was napkins for supper club. I found a graphic print, 100% cotton. Much to the dismay of many sewers, I did not prewash the fabric. I think it makes mitering corners easier with stiff fabric. You can learn to miter corners at Hipline Media, It is found on the Home Decor download. I made 10 napkins with about 3 yards of fabric. Shop after the holidays for great prices and fill your stash! Head to the quilting store for high quality cotton to make napkins for every occasion. These have mitered corners and are oversized at 20" X 20" . This silly project was designed to bring a little light to my bar. I really love this bottle. Mr. Preppy drilled a hole in the back large enough to feed a small strand through, and then I found all kinds of things at Hobby Lobby to adorn the top. It changes with the season! Then I headed back to the sewing room for a Martha project. These heart shaped potholders are so easy. I whipped up a bunch and decided I didn't do a very good job with the binding. But they are colorful and fun, and never look a gift horse in the mouth. What does that mean anyway? I did the pastel fabric for most of my friends. The black and red for my friend that has a white kitchen with darker accents and finally, the mustache one for my mom. She is a docent at the Dali museum, so I couldn't resist! I remember when I got engaged. Poor Mr. Preppy was a nervous wreck. Did he think I'd say no? Let's face it, it is a huge event in most people's lives, and the pressure these days to make it Pinterest worthy! After Mr. Preppy's proposal, which came during dessert, we went back to my parent's house, of course they knew. And the next night we had an impromptu engagement party. So when a friend contacted me about her daughter getting engaged, it was a secret surprise. But this was hard, I am crummy at keeping these kinds of secrets, there is so much joy involved. The plan was, when the newly engaged couple came to her house after dinner, there was going to be a party. Sorority sisters, relatives, family friends. My heart swells! So here's the platter I made for her very special night. May they live happily ever after! The birthday boy and the catch of his life! Hahaha! So today is Mr. Preppy's birthday. Of course there'll be cake and his favorite dinner, which I will blog about later. But ever since his 50th birthday, I just have to repost the photos of that day. There were no parties or get togethers, Mother Nature had way different plans! It was the most gorgeous snowstorm I remember. A fantastic snow day! We had the same meal that night that we'll have tonight, I always make a different cake (cuz I can..) and we just enjoyed the magical snow. We celebrated with friends later, but there is something so amazing about a snow like this in the South. It's rare, and it's a treat! So pardon me for reminiscing. I know there is a Nor'easter booming in New England, and I am just saying I would love a day of it again! So happy birthday sweetie! This year, we'll play golf! I wouldn't drive to the grocery!